Congratulations on being the winner for 1 pair of return tickets to Thailand with hotel accomodation and USD $300 Cash. We will be contacting you soon. Prizes are non exchangeable for cash and prizes must be claimed by 28th Feb 2019. The Contest is valid from 30th August 2018 to 31st January 2019.Contest entries must be completed in full and made in the manner specified on the regulations set on facebook or instagram by the closing date. You must include a description (in not more than 100 words) with a selfie holding the Khun Thai Tea Drinks and tag and share with the proper hashtags in your own account to qualify as a valid entry. . Failure to do so will result in an invalid entry.All entries must be posted by 2359 hours on 31st January 2019.Multiple submissions are allowed as long as you follow the regulars of what is qualified entry. Representatives ofKhun Thai Tea GFP will pick the best description amongst all eligible entries as the winner. Khun Thai Tea GFP decision is final and binding. No correspondence will be entertained about Khun Thai Tea GFP decision.The winner may be required to participate in public relations events tied to the contest to generate press coverage of the contest and the accessories range. This may include, but not be limited to, quotes given for inclusion in press releases and press conferences, interviews, etc.Khun Thai Tea GFP reserves the right to disqualify all entries that do not meet the rules and regulations of the Contest. These include entries submitted with invalid or incorrect information. One lucky winner will win a pair of return air tickets to Thailand , Plus Hotel Accomodation Plus USD$300 Cash. Prizes are non exchangeable for cash or other kind. Destination cannot be change of other kind. Travel period will be in the month of February 2019 for the period of 4D3N. 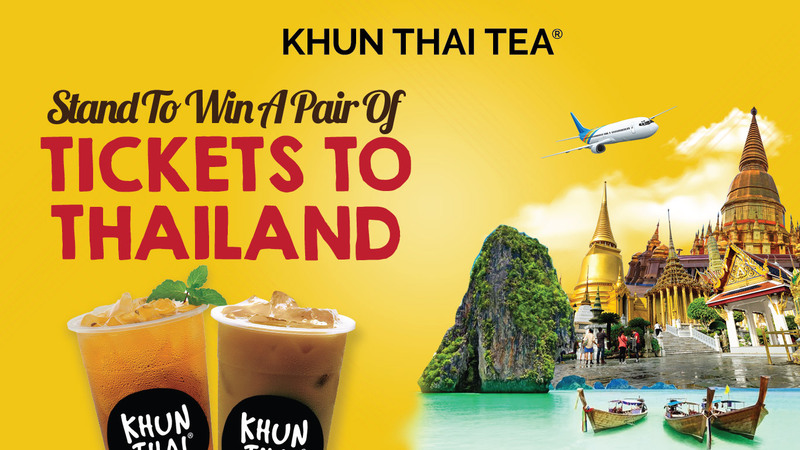 Timing for flights will depend on the flights availability, Winner can decide on the dates of travel and must inform the management of Khun Thai Tea GFP at least 10 days before date of departure for confirmation. All prizes are sponsored by Khun Thai Tea GFP. KhunTHai Tea GFP is a Singapore based entity exclusively incharge fo the branding and marketing activities of Khun THai Tea in all countries it is located in. Only stores listed in this website are official stores of Khun Thai Tea. rchase any drinks at hun Thai Tea. Take a photo with the drink or a selfie with the drink, Write a brief description of what you like about Khun Thai Tea.Hashtag the word. For Example, in Indonesia. #Khunthaiteaindoneisa for facebook or #khunthaitea.indonesia for instagram. Tag your friends and share the post. Our system will pick up these hashtags automatically. Its that simple . Be sure to like and follow us on Facebook and instagram.